Involuntary Smiles: What do Richard Simmons and an Attention Deprived Toddler Have in Common? What do Richard Simmons and an Attention Deprived Toddler Have in Common? A long time ago, I loved exercising. That was when I had time. And I know, I have heard many times that I have 24 hours in my day just like every one else does, but exercise has dropped dramatically on my priority list. Clean house, playing with the kids, crafting, etc. Everything else seems so much more important. And I have felt incredibly guilty about that. So I have been striving to change it. Because I love to exercise, remember? Yesterday a great gift arrived in the mail. Jeffrey bought me Richard Simmons Sweating to the Oldies. Oh so fun! I love all things dripping cheese. 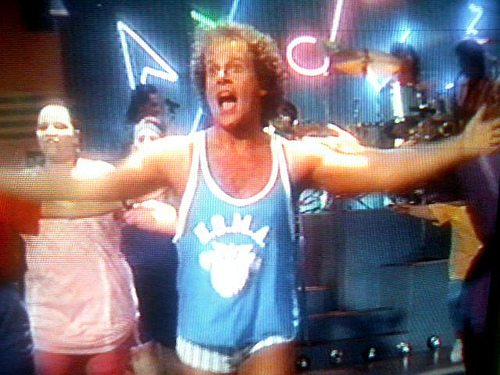 And let me tell you, Richard Simmons is the king of cheese. I can laugh at it and get the benefits of exercise. Win win. That man of mine sure knows me. So, during Keith's nap I turned it on. Slight problem, Faye was still awake. I have since discovered that my girl has serious jealousy issues. Heaven help us when we decide to have another. She hates for our attention to be devoted elsewhere. As I was trying to bust out the moves, Faye would look at me, scowl, and then walk into a table. I would scoop her up, give her some kisses, dry her tears and set her back down. Happily she would dance to the music for a few seconds, look at me to see if I was paying attention to her, and then when she noticed my attention was elsewhere, she would walk into the wall. What a little stinker pot. hahaha. Clever girl. Good for you for exercising!!! Holy crow! What a sweet baby. I need to babysit for you. Immediately. ha ha. i totally use to do richard's tapes! they are fun! and i loves me some cheese too :0) and how sweet of jeffrey to get it for you!